Tennis Facilities at Muirfield Village - Muirfield Association, Inc.
Regulation-size tennis courts are located at both recreation facilities in Muirfield Village. Glick Road Courts: The Glick Road facility features 6 lighted courts. 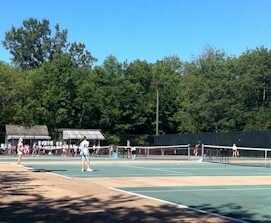 Five courts are reserved for the Association's organized tennis program through the tennis season. One court is available for first come, first play. Several courts at Glick Road are marked for Pickleball. Holbrook Courts: The Holbrook Recreation Complex features 4 lighted tennis courts. These courts are available on a first come, first play basis. Residents are welcome to play on their own any time a court is open. In addition, the Association offers a full tennis program for adult and junior residents at the Glick Road Recreation Complex. Go to the tennis home page and follow the links for more information. Private lessons are not permitted with the exception of lessons offered through the Muirfield tennis program. Muirfield tennis courts are for the exclusive use of Muirfield Village residents and their guests. During the summer, court times can be reserved at either facility, up to a week ahead of time, by calling the tennis pavilion at 614-761-1967. Each facility will allow one net to remain in place through the cooler months for the occasional pleasant days. Wind screens are removed in the fall after the tennis season is over. Tennis court lights will turn off automatically at 10:00 p.m. out of respect for and as a courtesy to those residents living nearby. Residents may turn on court lights if it is getting too dark to play prior to 10:00 p.m. Please follow posted lighting instructions.